Finally, I have my two custom galaxies, The Cosmic Eyelash A & B, named so because of the view we have from earth, both colliding and interacting edge on, and both galactic bulges visibly separated. (I'm still not sure if this is instead just one galaxy that gravitational lensing has separated into two views). These two brilliant, yet middle aged starburst galaxies are still somehow holding onto and are surrounded by turbulent reservoirs of hydrogen gas, converting vast quantities into new stars at a furious pace! This ALMA image shows the Cosmic Eyelash, that appears double and brightened by gravitational lensing. ALMA has been used to detect turbulent reservoirs of cold gas surrounding this and other distant starburst galaxies. By detecting CH+ for the first time in the distant Universe, this research opens up a new window of exploration into a critical epoch of star formation. They were uncovered by the discovery of extensive regions of carbon hydride (CH+) molecules in and around them. CH+ is an ion of the CH molecule and it is used to trace highly turbulent regions in other galaxies that are teeming with hydrogen gas. CH+ is a special molecule, it needs a lot of energy to form and is very reactive, which means its lifetime is very short and it can’t be transported far. CH+ therefore traces how energy flows in the galaxies and their surroundings. The observed CH+ reveals dense shock waves, powered by hot, fast galactic winds originating inside the galaxies’ star-forming regions. These winds flow through a galaxy and push material out of it. Their turbulent motions are such that the galaxy’s gravitational pull can recapture part of that material. This material then gathers into turbulent reservoirs of cool, low-density gas, extending more than 30,000 light-years from the galaxy’s star-forming regions closer to the center. With CH+, energy is stored within vast galaxy-sized winds and end up as turbulent motions in previously unseen reservoirs of cold gas surrounding the galaxy. By driving turbulence in the reservoirs, these galactic winds extend the starburst phase instead of quenching it. In the case of these older galaxies, galactic winds alone could not replenish any newly revealed gaseous reservoirs. Here the mass is provided by the galactic merger and accretion from other hidden streams of gas. This is a step forward in our understanding of how the inflow of material is regulated around the most intense starburst galaxies of the early universe. What is really fascinating are the kilopascal sized starburst clumps (hopefully noticeable with by custom textures), much different from the local nuclear starburstings we see in less active galaxies. You will easily notice the higher density of stars, specifically younger Blue stars and numerous nebulae when flying though my custom galaxy. Also very common are Red Giants and Black Hole binary stars. Gravitational lensing has played a critical role because the spatial enhancement associated with magnification provides a way to investigate the internal structure of distant, faint galaxies to levels unattainable with the current generation of instrumentation for typical dusty star-forming galaxies. This mod is for the 0.9.8.0 beta version of Space Engine. This is a very nice addon! And yes, it is a single galaxy whose image appears double, due to strong gravitational lensing by the foreground cluster. Here is a broader optical image to give some context, where the "Eyelash" is labelled SMMJ2135. 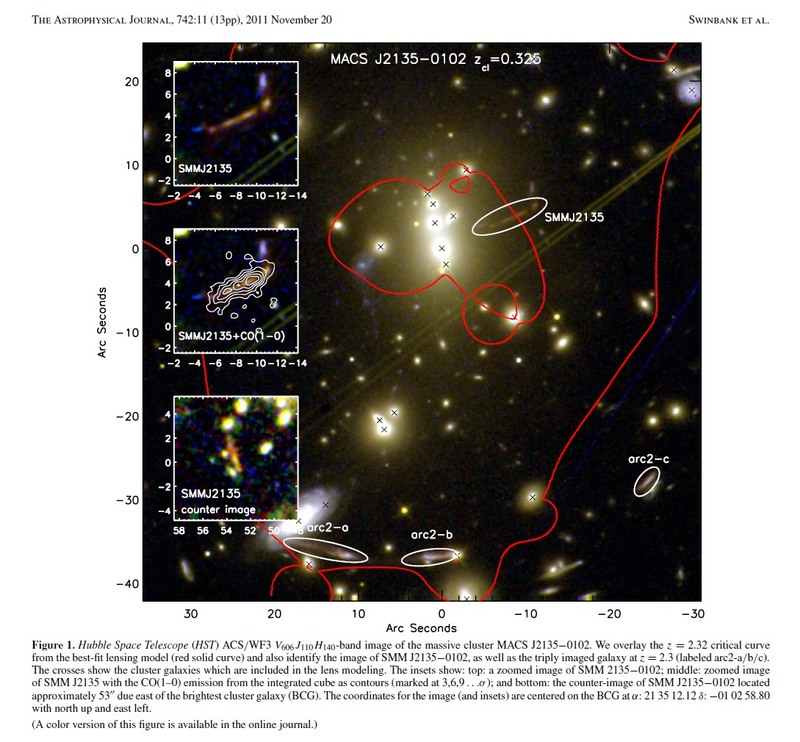 This foreground cluster also produces three separate images of another background galaxy, smeared out into thin arcs (labelled arc2-a, b, and c in the graphic.) So you can see the images are highly distorted. It also magnified the image of SMM J2135−0102 by a factor of about 37! (According to the lensing model by Swinbank, A. M. et al.) We can learn a lot about the early history of galaxy and star formation by these highly lensed images. How did you come by these distances? 9.7Gpc is ridiculous -- the galaxy is definitely not that far! But it is also not as close as 710Mpc. The most direct way to find its distance from available data is to use the cosmological redshift. The Eyelash has a redshift of z=2.3, so its distance by light travel time is 10.9GLY (3.34Gpc). By comoving distance (accounting for the expansion), it is 18.7GLY (5.73Gpc). With perhaps ~5% uncertainty due to things like the value of Hubble constant. This would put it inside the bounds of the SE universe, depending on which direction it is in (5Gpc to a face, or 8.66Gpc to a corner). Pretty cool. Is this the galaxy you are going to locate your Spelljammer project mods in? Well that's a fine how-do-you-do! I was under the impression this was two galaxies, as shown in the artists representation, which I used as the system file graphic. Plus some of the scientific articles I linked to were saying how the merger of two galaxies disturbs the pockets of cooler hydrogen gas, re-igniting star formation. Maybe they were being general. Oh well, you now have a basic mod of two unrealistic galaxies colliding at some random distance. Ta-da! I too was trying to determine the distance from a red shift of 2.3, which was the only reference I could find regarding it's distance. The direction is in the constellation of Aquarius, so I guess I could calculate some sort of vector to determine if it is co-moving or face on. Then I could get an actual number of light years or parsec away it is. I left some notes in the script showing how I calculated the distance. (red shift z = 2.3 = 2.996*10^23km = 31,671,740,600 light years away [I guess that doesn't exactly explain my madness...]) As far as brightness, again I was referencing something from an article what was misleading. I guess that doesn't count as research. As far as being used in my future Spelljammer Mod, I'm not sure. I have not yet tried adding intergalactic stars anywhere, only in the Milky-way so far. I don't think it is possible to locate custom stars gigs of parsecs away. I'll give it a whirl soon though, if I can determine the true distance to it. I even bothered to make a model of the galactic bulges blegh! I certainly did not mean to imply that your model or artist's rendition were incorrect! The source is a starburst galaxy that was fired up as the result of a merger, but we don't know what that unlensed galaxy looks like exactly. It almost certainly has a warped structure with tidal streams of stars strewn around, and the artist's rendition you build your model from may not be far from the mark. I think it looks amazing! Ah, no, nothing like that. The relationship between distance and redshift is totally independent of direction, or the orientation of the galaxy. And in this particular case we can also ignore the velocity of the galaxy through space. So yeah, let's go over how it works. The redshift (z) is a measure of how much the wavelength of the light has been shifted. z=2.3 means that the light has been stretched out by a factor of 3.3 (z=0 means no shift, z=1 means the wavelengths have doubled, z=2 means wavelengths tripled, etc). There are two causes for this shift: one is the regular Doppler effect due to the motion of the galaxy through space ("peculiar velocity") relative to us, which can be either a redshift or a blueshift depending on whether it is moving away from us or towards us, respectively. The other effect is the expansion of space itself, which stretches out the light as it travels. Fortunately, the peculiar velocities of galaxies are much slower than light, and for distant galaxies the Doppler effect is quite small compared to the redshift caused by expansion (Doppler shift is of order v/c, which for galaxies v is usually a few hundred km/s, which gives a shift less than ~0.01). 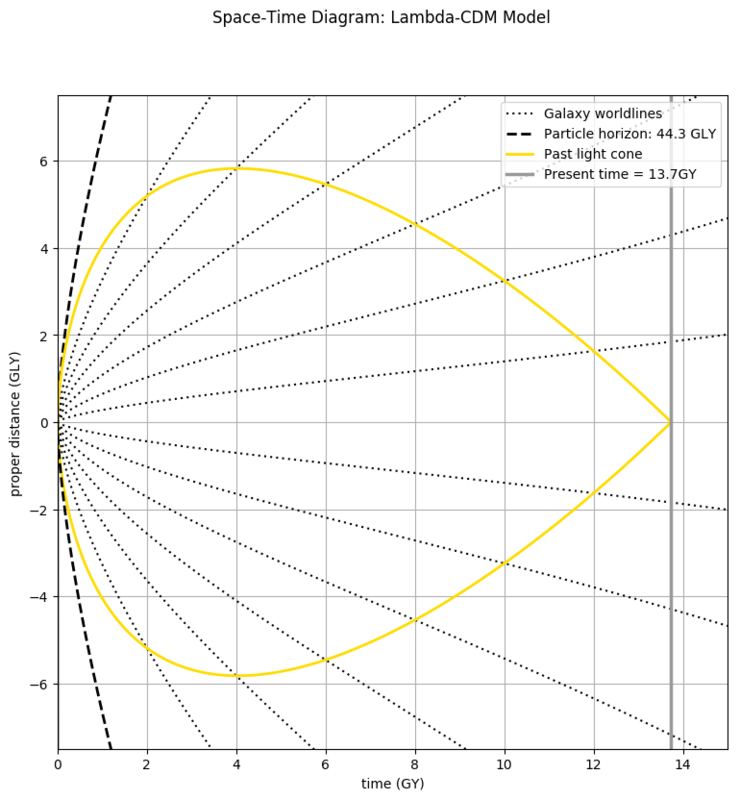 So for this galaxy with z=2.3 we can completely ignore the contribution of the Doppler effect and treat the shift as being purely due to cosmic expansion. What z=2.3 tells us then is that the scale of the universe is now 3.3 times larger than it was when the light was emitted. To derive a distance from that, all that needs to be done is compute the evolution of the universe, determine the scale factor over time, and find the distance or lookback time for which the scale factor was 3.3 times smaller than it is today. Tall order? Thankfully, you don't actually have to do all that yourself! You can use online tools. Simply plug in "cosmological redshift z=2.3" into Wolfram Alpha, and it will churn through the Lambda-CDM model and spit out for you the age of the universe, lookback time, and comoving distance to a source with that redshift. Easy! The result is in the ballpark of 10.8 billion years of lookback time or a comoving distance of about 18.5 billion light years. I check this with my own code and obtain nearly the same results (10.89GY lookback time and 18.8GLY comoving distance), differences simply due to uncertainties in the cosmological parameters. Wow. That is so clear and easy to understand! Thank you for your kind words too. I can now see how anything that far away would certainly have more space-time expanding between the two of us, which the effect of is much, much higher than simply our relative movement through it. Thanks again, I learn something new about the Z factor everyday! I would have simply poked 2.3 into my handheld calculator, rather than the correct factor of 3.3. I don't know where I got 31,671,740,600 lyr (9,710,599,812.1452 pc) as a comoving distance. Maybe I was fiddling with Hubble's law or the open/flatness of the universe lol. I was really just poking around on Wolfram or a similar online calculator. I wish I had documented what I did. I guess I have no idea what those words mean. Is the distance shown on the SE display on the left side of the screen showing Light Travel Time for distances to selected objects? But then I would enter the Comoving distance value into my script, rather than light travel time? Comoving distance and comoving angular distance are the same thing? I was also having a little trouble with Luminosity. The Cosmic Eyelash supposedly has the same light output as 2.3 trillion Sols (2.3e+12). I had to turn that line off in my script and instead use Absolute Magnitude of -26.09. That's what you see now. I kept SolFade set to True. That seems to work but as you get up close the texture creates a black spot in the middle of the light burst for awhile. Apparent Magnitude of 20.1088 didn't work very well. I guess if I put this in the right spot in the SE universe, and understand the hows and whys, I will consider it a satisfactory project. A HUGE Thanks to everybody's input!! Source of the post I guess I have no idea what those words mean. Light-travel distance: This one is perhaps the simplest to understand. It is how much time it has taken for the light to reach us, multiplied by the speed of light. So by the definition, the largest light-travel distance anything in our observable universe can have is the age of the universe times the speed of light. Proper distance: This is the physical distance (what you would measure with a ruler) between two objects if you could freeze the expansion and make that measurement in that moment. It is generally larger than the light travel distance, because the space has expanded during the time it took for the light to reach us. Comoving distance: This is a distance defined in such a way that it remains the same despite expansion. In other words we imagine slapping a coordinate system onto the universe and have those coordinates expand with it, so that the distances do not change. The comoving distance to an object is equal to its proper distance at the present time. Angular diameter distance is defined to be what you would calculate based on the apparent size of the object, if the normal Euclidean rules were correct. So this distance starts off behaving normally over short distances, but then grows more slowly than you expect due to the magnifying effect of the expansion on the image, and then starts shrinking again once the expansion causes images to grow bigger with distance. Another way to visualize this is with a space-time diagram of our universe. If space was not expanding, our past light cone would go off on a 45° angle (1 light year per year). But because of the expansion, the light cone is curved, and must ultimately start in the Big Bang singularity. So at some distance, the light cone must actually turn inward, filling in a smaller volume of space. This corresponds with the apparent size of objects growing larger with distance. It happens beyond a redshift of about z=1.6, or a lookback time of about 9.7 billion years. Weird, eh? Luminosity Distance: Normally we think the apparent brightness of an object goes as 1/r2. That is no longer true in an expanding space. So we define luminosity distance of an object to be what you would expect for an object with that luminosity and apparent brightness, if light obeyed the inverse square law on cosmological scales. What definition of distance would be most relevant for you? The SE universe is not (yet) expanding and does not simulate the effects of expansion besides reddening the light of distant sources. And from what I can tell, the distances to catalog objects are given in terms of light-travel distance. So I would probably use this galaxy's light travel distance as well. About 10.8 billion light years. 4.8 - 2.5log10(2.3x1012) = -26.1, as you had set. -26.1 - 5 + 5log10(3.31x109pc) = +16.5. That seems reasonable I think. I was channeling Sagan. "To make an apple pie from scratch, you must first invent the universe!" Solving the universe's evolution to calculate the distance-redshift relation actually isn't that strenuous -- easily less than 100 lines of computer code. Still, it's nice that others have invented the wheel first and we can use online calculators to do it for us. And I suppose I could have just said "convert z to distance by using this calculator", but I feel it's more satisfying to know where those calculators come from, or better yet to understand what z means and "what we are doing" when we convert it to a distance. I think one Galaxy model is not enough for space engine. Gnargenox, can you make some more galaxies models of lets say, the galaxies in the Virgo and Fornax clusters Please. Yeah sure! Next time I make some, you bet. Maybe sooner than later too. I'll let everybody know what I get in to. Source of the post Next time I make some, you bet. Maybe sooner than later too. Jump to it Gnargenox! I expect RESULTS! The whip cracks! . Cool galaxies. I'm trying to load your warped luminous red giant star, but the game says "object not found" when I type in the coords in your screencap. Oops sorry that was a completely different version. Procedural generation will not recreate that same star. For a while I was tweaking some things to see how it affected procedural generation.